Never in our wildest dreams would we have expected to see Todd sandwiched between Chico the monkey and Mary Ann from Gilligan's Island. Yet, it happened today on KREM 2's website. On a more serious note, looks like Todd has cleared his name. Thank God. It still makes you wonder about the people that the WSP has prosecuted that were also innocent, but didn't have Todd's tenacity and resources. It should send a chill down every American's spine. Thanks to Greg Haff for this link! Thanks to Jesse Ayotte's wife, Jennifer, for these great pictures. As usual, her photography is top-notch! 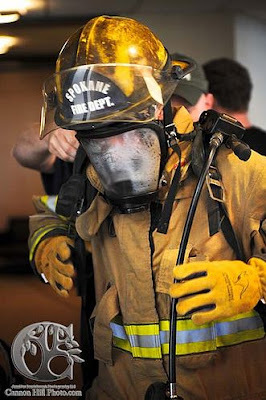 NARRATIVE: On March 8th 2008 at 6:27 pm the Spokane Fire Department responded to a reported house fire at 4610 N. Maple. The house sat at the intersection of two major arterials in north Spokane creating a traffic concern. The first apparatus on scene, Pumper Ladder 13, reported heavy smoke coming from a 1 story approximately 900 square foot single family residence. As the first crew inside advanced a pre-connected hose line into the basement they found fire in the area of the furnace where combustibles had been stored. The crew did a fast knock down of the fire then proceeded to determine if the fire had spread to any other areas or into the structure. The fire was contained to the one area. Simultaneously a search of the house found that everyone had gotten out safely. Two adults and 3 children were assisted by Red Cross as the house was not safe to occupy due to the heavy smoke damage. The fire is currently under investigation by the Spokane Fire Department. There were no injuries reported to civilians or Firefighters. The Fire Department is not saying that combustibles to close to the furnace was the cause of this fire but caution should be practiced when storing anything in the vicinity of any type of heating appliance.